Vladimir Putin is a wily ex-KGB fox who is constantly seeking ways to gain an advantage over other countries in Russia’s cold and warm wars around the world. Finally, he has found a critical weakness in the armor of democracy and capitalism and is exploiting it to the max – fake news and propaganda. Russia has used fake news and propaganda not only in America’s elections but also is using it in very effective ways in many other countries. How can we put a stop to this weapon that is quickly destroying the fabric of America and destabilizing the globe? Nations that heavily push falsified information online should be cut off from the USA internet. Any 3rd party country that remains connected to that nation would also be cut off – no country would choose to be cut off from the giant US internet & economy. This should be done for relatively short periods. It should be renewed if it is believed those hostile nations are still pushing false information out. This penalty should be used both on nations that have their own governments back false propaganda like Russia, and also on nations who don’t police their citizens like Nigeria. Individuals and corporations who push out purposefully falsified information in order to have political influence should be subject to civil and escalating criminal penalties. Jeremy told me about a discussion he had with his friend. Jeremy later told me he was in shock… How do you reply to someone who refuses to believe any source? “If something doesn’t fit with what I know, I don’t believe it.” Basically, if he learns a fact that does not fit with his existing worldview, the fact must be fake. This attitude prevents any new learning or productive debate. And a huge number of people in our world today have this attitude. My guess is more than half. What can be done to change this? How can we bring people back to believing new facts from respected sources? I was curious about how people have been reacting to Donald Trump’s recent behavior (earning Putin’s praise and his own Secretary of Defenses resignation by abandoning US allies in Syria, shutting down the government to try to get a wall), so I looked at Google Trends to see search traffic on terms related to assassination. 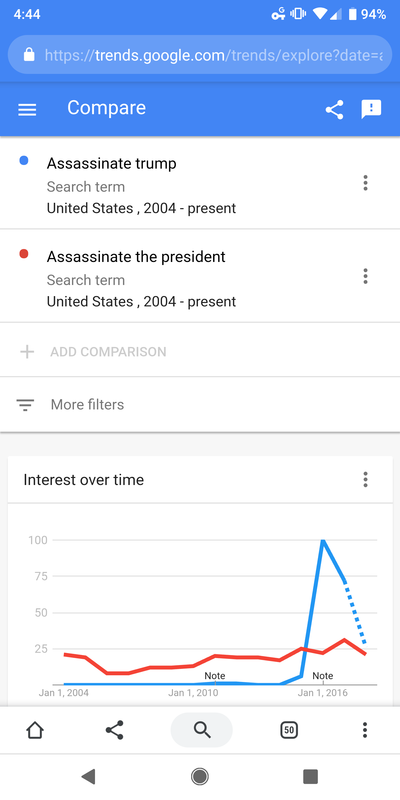 It appears there is now the highest ever search traffic on “assassinate the president” in America since Google started tracking this. I don’t advocate this course of action, but I wouldn’t want to be Trump right now either. Price discovery is indeed difficult in the current market. However, the current healthcare market is no where close to a free market. In thirty-five states and the District of Columbia, you’d first have to acquire a certificate-of-need (CON) from the state healthcare regulators. In order to get certificate of need, you must prove that the community “needs” the new or expanded service, and existing providers are invited to challenge your application. Existing hospitals typically don’t want new competitors taking away their patients, so they vigorously fight to prevent new CON’s from being issued. And conlaws are just one example of perverse effects of state intervention into the healthcare market, from state laws restricting insurance competition, to severe restrictions on new entrants to the medical labor market, to drug monopolies.